Lodi Gyaltsen Gyari was born in Nyarong, Eastern Tibet, in 1949, where he received a traditional monastic education. Mr. Gyari and his family fled from Tibet to India in 1959. Realizing that Tibetans need to publicize their struggle to the world he became an editor for the Tibetan Freedom Press and founded the Tibetan Review, the first English language journal published by Tibetans in-exile. Lodi Gyari was the Special Envoy of His Holiness the Dalai Lama. Mr. Gyari is the lead person designated by His Holiness the Dalai Lama to commence negotiations with the Chinese Government. However, on 01 June 2012, Kalon Tripa Dr. Lobsang Sangay, Head of the Central Tibetan Administration accepted the resignation of the Special Envoy of His Holiness the Dalai Lama Lodi G. Gyari. Mr. Gyari served as the Executive Chairman of the Board of the International Campaign for Tibet, an independent Washington based human rights advocacy group and later retired in December 2014. Mr. Gyari lives in McLean, Virginia with his wife Dawa Chokyi and their six children. Lodi Gyaltsen Gyari is a seasoned and skilled diplomat who is an impassioned advocate for the Tibetan people, universal human rights and global democratic reform. Mr. Gyari has successfully worked at the highest levels of the international arena. He is trusted, consulted and admired by many world leaders and members of the diplomatic corps. Prior to his arrival in the United States in 1990, Lodi Gyari served in the senior most elected and appointed positions of the Tibetan administration in exile – from Speaker of the Parliament to Cabinet Minister. At the age of 30, Mr. Gyari was the youngest elected Speaker of the Parliament. He was also one of the youngest people to be appointed by His Holiness the Dalai Lama to the Kashag (Cabinet), to serve in the Tibetan administration. Appointed by His Holiness the Dalai Lama to initiate and lead a dialogue process with the government of the People’s Republic of China, Lodi Gyari not only conducted nine rounds of high level talks in China and elsewhere, but also led an extensive behind the scenes diplomatic effort to sustain the process, expand the channels of communication, build trust with the Chinese leadership and maintain a broad international interest in the dialogue process. Mr. Gyari was born into an influential family in Nyarong, Eastern Tibet and recognized as a ‘reincarnate’ Buddhist lama (a ‘Rinpoche’.) His early education was in the traditional Tibetan monastic system, where incarnate lamas are offered a unique kind of training, an intensive and closely supervised curriculum somewhat akin to the tutorial system of universities like Oxford or Cambridge, except that in the Tibetan context, the student is taught one on one by an outstanding master scholar and practitioner. When he was still young, Mr. Gyari’s monastic education and the life his family had known for generations were disrupted by the tragic events that befell his homeland. Nevertheless Mr. Gyari has continued ever since to cultivate and sustain his deep devotion to Buddhist traditions, and to this day he maintains close relationships with many eminent Tibetan Buddhist masters and lineage heads. Over the years, he has found himself uniquely placed to deepen his study of the rich wisdom of the Tibetan Buddhist tradition with its most revered and senior living exponents. As an acknowledgement of his religious background Tibetans refer to Lodi Gyari as ‘Gyari Rinpoche’. When forced into exile by the Chinese occupation of Tibet, Mr. Gyari was drawn into the ongoing struggle for Tibetan freedom. In this effort he reached out beyond the confines of his community to seek guidance and wisdom from eminent Indian leaders and thinkers, some of who were the giants of the Indian freedom movement. Later in life, Mr. Gyari was able to continue this quest to learn from prominent world leaders and opinion makers in the United States and Europe. Mr. Gyari cultivated his relationship with these political mentors in the same way a devout Buddhist student will learn from his teacher, and thus he has had the unique opportunity to learn from both the world’s greatest Buddhist thinkers and political leaders of our time. As a young man, deeply affected by what he had seen of the brutal occupation of Tibet, Mr. Gyari longed to take up active resistance in order to help free his fellow Tibetans. He was selected to be educated as a translator for the resistance fighters being trained in the United States. 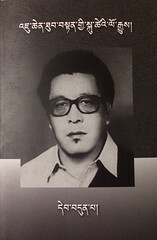 However fate and circumstances intervened, and instead he became a journalist, first as the editor of the Tibetan Freedom Press and then starting the Voice of Tibet (Tibetan Review), the first ever English language publication by a Tibetan. Mr. Gyari continued to believe in the need for armed resistance in Tibet, but also saw the need for a strong grassroots political movement among the younger generation of Tibetans. To pursue this, in 1970 Mr. Gyari, together with three close associates, established the Tibetan Youth Congress with the goal of motivating the younger generation of the Tibetan community to unify and pursue the political struggle for Tibet’s future. The establishment of the Tibetan Youth Congress created a strong political force in the exiled community, and is credited with introducing democratic principles and practices that have had a profound influence on the democratic evolution of the exiled government. Today the Tibetan Youth Congress is the largest Tibetan political organization in exile. Mr. Gyari himself is now regarded as a pioneering figure in introducing and establishing a culture of democracy and modernity into the exiled Tibetan community. While the urgency of the time and the pace of events prevented Mr. Gyari from taking a degree or pursue higher academic studies, this was to prove no disadvantage to his emerging role as a very effective and respected statesman. As he matured, Mr. Gyari went through a profound change of heart, from dreaming of resistance to becoming a committed believer in non-violence and the pursuit of a peaceful solution, as advocated by His Holiness the Dalai Lama. This transformation was a gradual one that began when Mr. Gyari rose through the ranks of the Tibetan leadership, first as the Speaker of the Parliament and then later as a member of the Kashag (Cabinet). Mr. Gyari is today one of the most dedicated and articulate proponents of His Holiness the Dalai Lama’s Middle Way approach, which Mr. Gyari calls the most farsighted and brilliant strategy for the Tibetan people. The Middle Way approach seeks genuine autonomy for all Tibetans living in the traditional provinces of Tibet within the framework of the People’s Republic of China. Whilst in his role as Special Envoy to His Holiness the Dalai Lama, Mr. Gyari also served as President of the International Campaign for Tibet in Washington DC from 1991 to 1999. During that time the organization grew from less than one thousand members to more than 75,000, and from an organization with little funding to one with a multi-million dollar budget. Today, the International Campaign for Tibet is the largest and most influential non-governmental organization in the West working on behalf of the Tibetan people with offices in Amsterdam, Berlin and Brussels. Following his term as President of the International Campaign for Tibet, Mr. Gyari joined the organization’s Board of Directors as Executive Chairman, a position he still holds. Mr. Gyari has advocated for key legislation in the United States Congress benefitting the Tibetan people. From 1991-2011, more than $185 million in funding was set aside by Congress specifically for the Tibetans in Tibet and in exile. His efforts have contributed directly to the institutionalization of U.S. support for Tibet in the form of the Tibet Policy Act (2002), comprehensive legislation that details policy and material support to the Tibetan people and His Holiness the Dalai Lama for a negotiated solution to the Tibetan problem. The Tibet Policy Act also codifies the establishment of the position of Special Coordinator for Tibetan Issues within the U.S. Department of State. The Special Coordinator’s central objective is to promote substantive dialogue between the government of the People’s Republic of China and the Dalai Lama or his representatives as well as assist in preserving the distinct religious, cultural and linguistic heritage of the Tibetan people. In the 1980’s and 1990’s Mr. Gyari had also served as the head of the Tibet-UN initiative. He and his team successfully reintroduced the Tibet issue into the UN system when the UN Sub-Commission on Prevention of Discrimination and Protection of Minorities passed the first United Nations resolution on Tibet in August 1991, ending 25 years of silence on the situation in Tibet. Mr. Gyari’s life-long diplomatic experience, his firm belief in His Holiness’ Middle Way approach and his passionate desire to help his fellow Tibetans led to the most important mission of his life, when His Holiness the Dalai Lama formally entrusted him with the task of leading negotiations with the government of the People’s Republic of China. Mr. Gyari had first visited China in 1982 and again in 1984 as one of the three members of a high level delegation for exploratory talks. Beginning in 2002, he led the Tibetan team that conducted negotiations with the Chinese government for nine separate rounds of talks. During this period his team presented a comprehensive proposal to the Chinese government for the implementation of genuine autonomy in Tibet as a mutually beneficial solution to the conflict. While the Chinese leadership bluntly accuses Mr. Gyari of spearheading the internationalization of the Tibet issue on behalf of His Holiness the Dalai Lama, it also acknowledges that during Mr. Gyari’s stewardship the relationship between His Holiness the Dalai Lama and Beijing was the most stable and long lasting. With the transfer of political power from His Holiness the Dalai Lama to the democratically elected Tibetan leadership in 2011, Mr. Gyari decided to resign as Special Envoy. He remained in this position for another year as he hoped to maintain the fragile relationship with the government of the People’s Republic of China which he had worked hard to establish and sustain during his tenure as the Special Envoy. However, due to the utter lack of progress in the talks and the increased repression inside Tibet, he resigned in May, 2012. Mr. Gyari continues to be actively involved in projects and programs to promote dialogue between Tibetans and Chinese. He is also committed to initiatives to promote right livelihood and socially responsible investments and business to reduce poverty in the Himalayas and Southeast Asia. Mr. Gyari is the Chairman of the Board of the Conservancy for Tibetan Art and Culture, a U.S. based non-profit organization that works to preserve Tibet’s living cultural heritage in Tibetan cultural areas and communities around the world, working with leading institutions, scholars, and religious leaders. Additionally, Mr. Gyari both formally and informally supports and promotes numerous civil society, cultural and Buddhist organizations and projects dedicated to maintaining Tibet’s cultural heritage, protecting the Tibetan environment, improving livelihoods, health and education for Tibetan communities, protecting sacred sites in Asia and preserving Tibetan texts, language and art. Through his involvement with non-profit programs and civil society, Mr. Gyari has been instrumental in mobilizing over $100 million in support for more than twenty organizations and programs. Mr. Gyari has not limited his activities to Tibet issues; he is a citizen of the world. Lodi Gyari’s international activities also have, and continue to include, active engagement in peace making and conflict resolution through Kreddha, the International Peace Council for States, Peoples and Minorities which he co-founded with the late Don Rodrigo Carazo, former President of Costa Rica, and others. Through his involvement with the Sanithirakoses-Nagapateepa Foundation and as founding member of the International Network of Engaged Buddhists, based in Bangkok, Mr. Gyari is engaged in the promotion of responsible environmental stewardship and development and social justice in different parts of the world. He is actively involved in alleviating the plight of other nations and peoples. He is one of the founders of the Allied Committee, an organization formed to advance the common issues faced by the Tibetans, Uyghurs and Mongolians under Chinese rule. This initiative inspired the founding of the Unrepresented Nations and Peoples Organization, a world-wide organization established before the break-up of the Soviet Union to promote the rights of peoples and minorities through democracy and non-violence. As a founder of UNPO, Mr. Gyari travelled extensively to the Baltic States and other East European nations, working with the democratic movements in those countries. UNPO became very active in promoting equitable solutions to the conflicts in East Timor, Burma, Aceh in Indonesia, Ogoni in Nigeria and Zanzibar, and in supporting the Taiwanese democratic movement. UNPO effectively lobbied at the UN on a wide range of human rights issues and succeeded in placing the issue of population transfer on the agenda of the Commission on Human Rights, who appointed a special rapporteur, passed a resolution on the subject and approved a draft declaration, all of which represented an important milestone. Over the years membership in UNPO has grown steadily and now the organization has almost 70 diverse member nations and ethnic groups worldwide. Mr. Gyari was also a cofounder with Michele Bohana, Joel McCleary and Lavinia Currier of the Institute for Asian Democracy (IAD), which became one of the first, most enduring and effective organizations working for human rights and democratic reform in Burma. In the early 1990’s IAD worked closely with human rights leaders such as the former Senator Daniel Patrick Moynihan and published for concerned international leaders, comprehensive reports on the situation in Burma and recommendations for action. Mr. Gyari is regularly invited to share his thoughts at academic institutions and universities in the United States, Europe and Asia. He has contributed to numerous publications and spoken at the Council on Foreign Relations, The Kennedy School of Government, The Brookings Institution, Center for Strategic and International Studies, Asia Society, Asia Centre in Paris, The Institute of South Asian Studies in Singapore, India International Center, The Heritage Foundation, The Foreign Correspondents’ Club of Japan, Chatham House, Australian National University and others. Mr. Gyari travels extensively, and has visited more than 50 countries. He has been invited numerous times to testify before the US Congress, European Parliament and other government bodies and institutions on the Tibet issue and the threats confronting Tibet’s cultural and spiritual heritage. Lodi Gyari has published editorials in many publications including The South China Morning Post, Asian Wall St. Journal, The Washington Post, The Harvard Asia Quarterly and The Far Eastern Economic Review. Mr. Gyari has also contributed chapters in several published works including ‘Challenges faced by Tibetans in Reaching a lasting Agreement with China’ in Implementing Negotiated Agreements: The Real Challenge to Intrastate Peace (M. Boltjes, ed., The Hague 2007, Asser Press). Mr. Gyari lived in McLean, Virginia with his wife, Dawa Chokyi. They divide their time between India and the U.S. On 29 October 2018, he passed away in San Francisco. He was 69 and survived by his wife, Dawa Chokyi, their 6 children, 5 grandchildren, his mothers, 4 brothers, and 3 sisters. On 5 November, Rinpoche’s mortal remains were flown from San Francisco and the last rites were performed with full honours at Mindrolling Monastery in Clementown, Uttarkhand on 18 November 2018.